By 2020, 365 million Americans will live in cities, and with that increase in urbanization comes concerns over public safety. In a new report, the Brookings Institution examines how digital technology, mobile networks, and integrated solutions help officials in 17 global cities, including two U.S. cities, manage public safety and law enforcement. In the report West and Daniel Bernstein, nonresident senior fellow at the Center for 21st Century Security and Intelligence at the Brookings Institution, examined Abuja, Nigeria; Amsterdam; Astana, Kazakhstan; Bangkok; Bogota, Colombia; Cairo; Copenhagen, Denmark; Jakarta, Indonesia; Kuala Lumpur, Malaysia; Kuwait City; London; Madrid; New York; Paris; Riyadh, Saudi Arabia; Singapore; and Washington. 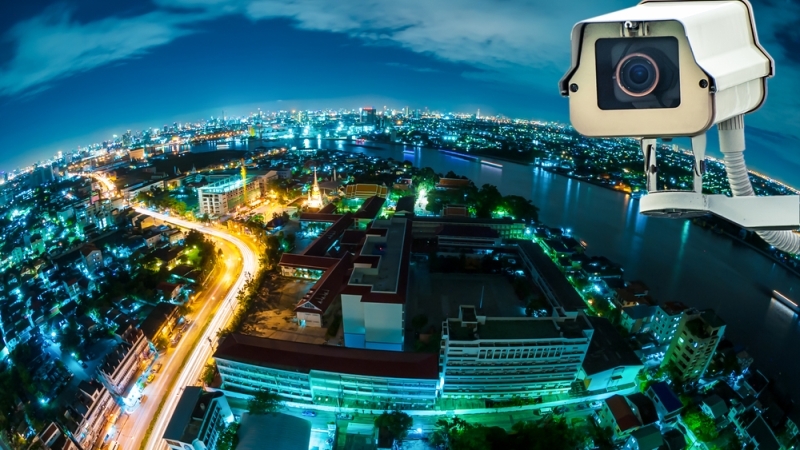 Though the researchers studied many international cities, their findings easily apply to U.S. cities looking to improve public safety through technology. In order to measure public safety innovation from leading cities, the researchers used six broad dimensions of public safety innovation to assess the cities. The dimensions included whether the city emphasized a metropolitan vision on public safety, had a sufficient digital infrastructure, showed evidence of public safety effectiveness, adopted new public safety features, used data analytics to improve decision-making, and engaged in community outreach through law enforcement. Using these dimensions, cities were scored on a 120-point scale. 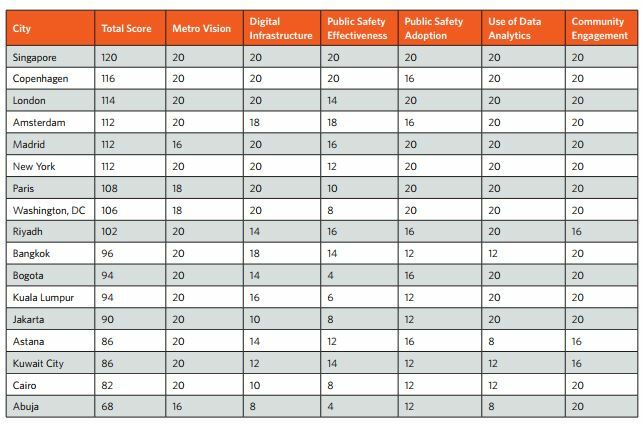 After examining which cities ranked well and which cities are lagging behind, West and Bernstein highlighted 12 best practices, and recommendations on implementing the practices, that enable cities to take advantage of digital technology to improve public safety. Increasing budget for digital infrastructure investments–Investing financial resources in digital infrastructure and solutions pays off in improved productivity, competitiveness, and innovation. Cities must upgrade their telecommunications facilities so their residents and law enforcement can reap the benefits of technology innovation. Overcoming funding challenges–The biggest difficulty in most municipal areas is funding. Budgets are strained as cities confront rising populations, public discontent, community disorder, and organizational dysfunction. Law enforcement must balance demands from a number of different sources and figure out ways to become more efficient and effective. Understanding how digital technology improves the efficiency of operations is important for city officials. Implementing integrated command centers–Public officials need reliable and up-to-date information regarding law enforcement and public safety. Broadband trunking systems help agents integrate information from voice, data, and collaboration. Using broadband that brings together material from many different sources improves response times and public safety protection. Boosting government efficacy and transparency–Most public agencies are inefficient in the way they function. Digital and mobile technologies offer the opportunity to improve efficacy and transparency in law enforcement because officials can blend digital solutions with traditional approaches. This includes mobile apps for residents to communicate with law enforcement, body cameras that protect both police and private citizens, the use of data analytics to improve decision-making, the deployment of emergency alerts, and the employment of sensors and cameras to detect criminal activities. Using crowd-sourcing platforms to encourage citizen participation–Crowd-sourcing has the potential to improve public engagement with law enforcement. Social media sites represent a way for the police to garner useful information and to test particular products before they are released to the general public. Building public support–Law enforcement needs help from the community in order to solve crimes and prevent disruptive behavior. Yet in many neighborhoods, residents are skeptical of the police. They worry that law enforcement is unfair, unresponsive, or even discriminatory in their regular practices. What is needed is a community engagement strategy that builds rapport with local residents. Having a regular means of communicating with the general public is crucial to building the support that law enforcement requires. Breaking down organizational stovepipes through technology–Many police systems are decentralized and fragmented, and not very good at sharing information with other jurisdictions. This yields organizational inefficiencies and an inability to effectively promote public safety. Digital technology represents a way to break down these stovepipes and create more integrated solutions. Collaboration creates possibilities for information-sharing and tackling crime networks. embrace change. This is especially the case with police because officers have considerable independence in their day-to-day actions, according to the authors. The familiar often drives out the new practice or the new approach to doing things. In order to adopt new practices, organizations have to create strong training programs and incentives to handle things the proper way. Using police body cameras and CCTV cameras to improve accountability–The use of police body cams and CCTV cameras reduces citizen complaints. If officers and community members think the record of their encounter will be available publicly, it promotes honesty on both sides of the engagement. Balancing civil rights with law enforcement is crucial to moving ahead with this innovation. Deploying data analytics and social media to fight crime–Data analytics represent an interesting way to deploy technology to fight crime. Data analytics tools could help police officers use past behavior to anticipate which people and areas of the city are most at risk of safety problems. It can also improve transparency and create strong metrics to better understand police performance. Additionally, social media can help law enforcement track public responses to crime and natural disasters. Balancing privacy and security concerns–Privacy is a challenge in many places, and balancing privacy protection with public safety is crucial. Authorities must determine how to maintain the confidentiality of public information while also keeping people safe. The public places a high value both on privacy and security.